who would you most like to see as a girl? The fans pick: akatsuki is even mais awsome! whos art is better: dei's or sasori's? “Yo Pain,” Hidan shouted, “Where the f*** is Kakuzu? I checked his room and all his s*** is gone.” Pain was sitting in his office with Konan standing seguinte to him. Pein and Konan were standing seguinte to each other as Pein handed her a piece of paper. “Your mission is to examine the village’s security around the perimeter,” He explained. “Did someone have rosquinhas and wouldn’t share them?” Tobi asked. Set Up - In order to play you will need two six-sided dice, a board with twelve spaces which includes a start and finish space, and game pieces to symbolize the characters you are using. Object of the Game - Your character must be either the first character to reach the finish o espaço or be the only one to still have health. If you were assigned on a mission who would be your partner? 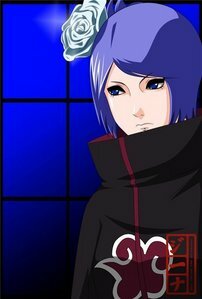 after the death of pein, are konan back to the akatsuki?